FLOW-3D possesses the capabilities to simulate regular linear and nonlinear propagating surface waves as well as irregular waves. A linear wave has a sinusoidal surface profile with small amplitude and steepness, while a nonlinear wave has larger amplitude (finite-amplitude), sharper crests and flatter troughs than the linear wave. The nonlinear waves can be categorized into Stokes, cnoidal and solitary waves, according to the wave characters and the mathematical methods used to obtain their solutions. 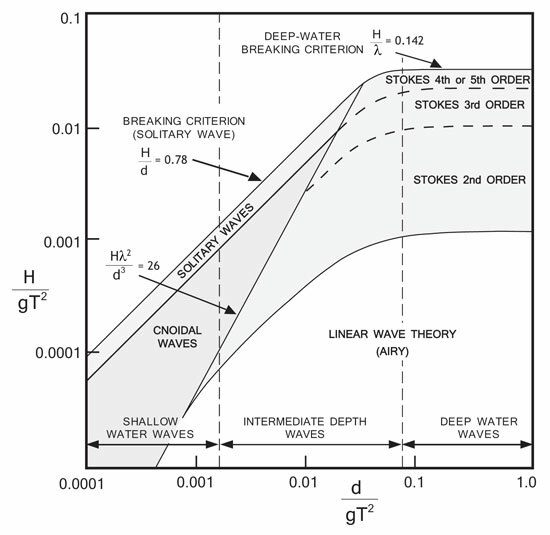 As shown in Figures 1 and 2, the Stokes wave is a periodic wave in deep and transitional water. The cnoidal wave is a long periodic wave in shallow and transitional water and has even sharper crests and flatter troughs than the Stokes wave. Different from the Stokes and cnoidal waves, solitary wave is a non-periodic wave existing in shallow and transitional water. It possesses a single crest and no trough and is completely above the undisturbed water level. Mathematically, it is a limiting case of the cnoidal wave when the wavelength becomes infinity. The classifications of deep water, transitional water and shallow water for waves can be found in Table 1. Although the linear wave theory (Airy, 1845) has been used in many applications, the nonlinear wave theories often provide significant improvement in accuracy over the linear wave theory when the wave amplitude is not small. In FLOW-3D, three nonlinear wave theories are used for nonlinear wave generation: the fifth-order Stokes wave theory (Fenton, 1985), the Fourier series method for Stokes and cnoidal waves (Fenton, 1999), and McCowan’s theory for solitary wave (McCowan, 1891; Munk, 1949). Among them, Fenton’s Fourier series method is valid for all kinds of periodic propagating waves in deep water, transitional water and shallow water, including linear, Stokes and cnoidal waves. Moreover, it possesses higher order of accuracy than other wave theories (USACE, 2008). It is thus the recommended method to generate any type of linear and nonlinear periodic waves at all water depth. For solitary wave, McCowan’s theory used in FLOW-3D has higher order accuracy than the other widely used theory developed by Boussinesq (1871). The irregular wave represents the natural sea state where wave properties are not constant. In FLOW-3D, the irregular wave is represented by a superposition of many linear component waves with different amplitudes and frequencies and random phase shifts. 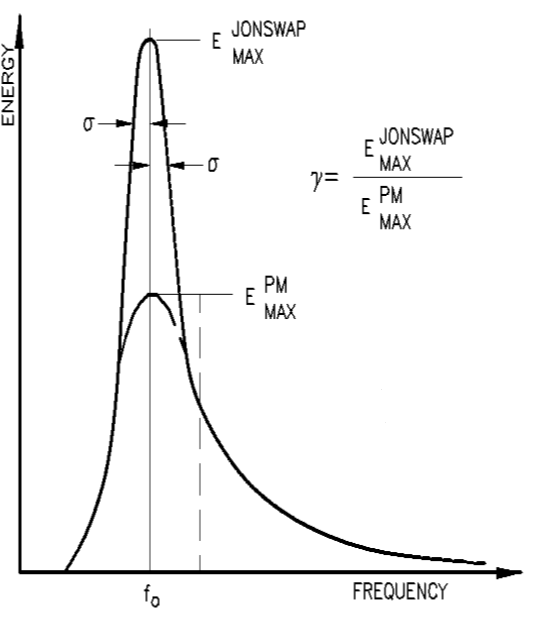 The Pierson-Moskowitz (P-M) (Pierson and Moskowitz, 1964) and the JONSWAP wave energy spectra (Hasselmann, et al., 1973) are implemented in FLOW-3D to generate the component waves. Other wave energy spectra can be used by importing a user-defined data file. To save computation time, the wave can be defined not only at a mesh block boundary but also as an initial condition. The animations below show the examples for all the types of wave with or without wave initialization. Successful applications of FLOW-3D have been made for linear and nonlinear water wave simulations. Please refer to the examples in Bhinder et. al (2009), Chen (2012), Hsu et. al (2012) Thanyamanta et. al (2011) and Yilmaz et. al (2011) for more details. Airy, G. B., 1845, Tides and Waves, Encyc. Metrop. Article 102. Bhinder, M. A., Mingham, C. G., Causon, D. M., Rahmati, M. T., Aggidis, G. A. and Chaplin, R.V., 2009, A Joint Numerical And Experimental Study Of a Surging Point Absorbing Wave Energy Converter (WRASPA), Proceedings of the ASME 28th International Conference on Ocean, Offshore and Arctic Engineering, OMAE2009-79392, Honolulu, Hawaii. Boussinesq, J., 1871, Theorie de L’intumescence Liquide Appelee Onde Solitaire ou de Translation se Propageant dans un Canal Rectangulaire, Comptes Rendus Acad. Sci. Paris, Vol 72, pp. 755-759. Chen, C. H., 2012, Study on the Application of FLOW-3D for Wave Energy Dissipation by a Porous Structure, Master’s Thesis: Department of Marine Environment and Engineering, National Sun Yat-sen University. Fenton, J. D., 1985, A Fifth-Order Stokes Theory for Steady Waves, Journal of Waterway, Port, Coastal and Ocean Engineering, Vol. 111, No. 2. Fenton, J. D., 1999, Numerical Methods for Nonlinear Waves, Advances in Coastal and Ocean Engineering, Vol. 5, ed. P.L.-F. Liu, pp. 241-324, World Scientific: Singapore, 1999. Hasselmann, K., Barnet, T. P., Bouws, E., Carlson, H., Cartwright, D. E., Enke, K., Ewing, J. A., Gienapp, H., Hasselmann, D. E., Kruseman, P., Meerburg, A., Muller, P., Olbers, D. J., Richter, K., Sell, W., and Walden, H., 1973, Measurement of Wind-Wave Growth and Swell Decay During the Joint North Sea Wave Project (JONSWAP), German Hydrographic Institute, Amburg. Hsu, T. W., Lai, J. W. and Lan, Y., J., 2012, Experimental and Numerical Studies on Wave Propagation over Coarse Grained Sloping Beach, Proceedings of the International Conference on Coastal Engineering, No 32 (2010), Shanghai, China. Kamphuis, J. M., 2000, Introduction to Coastal Engineering and Management, World Scientific, Singapore. Le Méhauté, B., 1976, An Introduction to Hydrodynamics and Water Waves, Springer-Verlag. McCowan, J., 1891, On the solitary wave, Philosophical Magazine, Vol. 32, pp. 45-58. Munk, W. H., 1949, The Solitary Wave Theory and Its Application to Surf Problems, Annals New York Acad. Sci., Vol 51, pp 376-423. Pierson W. J. and Moskowitz, L., 1964, A proposed spectral form for fully developed wind seas based on the similarity theory of S.A. Kitiagordskii, J. Geophys. Res. 9, pp. 5181-5190. Thanyamanta, W., Herrington, P. and Molyneux, D., 2011, Wave patterns, wave induced forces and moments for a gravity based structure predicted using CFD, Proceedings of the ASME 2011, 30th International Conference on Ocean, Offshore and Arctic Engineering, OMAE2011, Rotterdam, The Netherlands. USACE (U.S. Army Corps of Engineers), 2006, Coastal Engineering Manual, EM 1110-2-1100, Washington, DC.